Apple stands at the threshold of becoming the nation's largest technology company. Apple will soon surpass Hewlett-Packard in quarterly revenue while delivering more than $.25 of each revenue dollar to the net income line. By the end of this month and in response to the company's December quarter results, Apple will again surpass Exxon-Mobil in market cap to become the nation's most highly valued enterprise. To put Apple's recent rates of growth in perspective, in FY2011 that ended in late September, the company's $108.249 billion in revenue represented a 677% rise in revenue in the six years since FY2005 and the $27.68 in earnings per share represented 1,686% growth over this same six-year period. Apple is the undisputed enterprise success story of the new millennium. It's product innovation that drives Apple's accelerated rates of growth and it's innovation that will deliver monster-sized results in what I have dubbed "Apple's Monster Quarter." Today I am publishing my revenue and earnings estimates for Apple's first quarter of FY2012 ended December 31st. For the quarter I estimate revenue of about $44 billion and earnings per share of $12.20. In this one quarter Apple's revenue and eps results will most likely exceed the company's total revenue and earnings per share for all four quarters of FY2009 that ended just over two years ago. These estimates represent an expectation of 64.54% year-over-year revenue growth in the quarter and 89.75% growth in earnings per share. Apple's accelerated rates of growth are fueled by the popularity of the company's iOS-based products including the iPhone and iPad and the company's relentless geographic expansion. Currently, the only practical limits on Apple's rates of growth are device production capacity and the pace at which the company can create sales and support infrastructure in underserved global markets. At this time Apple is addressing only a fraction of the global market for the company's digital lifestyle products. Although domestic revenue as a percent of total revenue will rise in the December quarter due to the initial release of the iPhone 4S in the United States and the addition of Sprint as an authorized iPhone carrier, by next fiscal year revenue sourced from outside the United States may represent two-thirds of the company's revenue total. The graph below illustrates the influence of the iPhone and iPad on my anticipated December quarter revenue outcome. Collectively the two products represent about 71.5% of estimated revenue in the quarter and both products have been brought to market within the past five years. For the quarter I estimate unit sales of 35.75 million iPhones. The success of the iPhone's domestic launch is not subject to dispute. Verizon recently reported sales of 4.2 million iPhones in the quarter and continuing strong demand. The December quarter is the first holiday quarter in which the iPhone was available on the Sprint and Verizon networks. Pent-up demand following Apple's decision to defer launch of the new iPhone handset to the December quarter will have provided a boost to the unit sales results. Apple ended the September quarter with only 5.75 million iPhone handsets in the global channel. Contingent on product supply, the channel could have absorbed an additional five million units by the end of the December quarter and remained within Apple's target range of four weeks to six weeks of channel inventory. In other words, it's supply, not questions about demand, that will determine the iPhone's unit sales results in the December quarter. The December quarter is the first quarter in which the relative strength of the iPhone will have been tested against any and all other smartphone handsets available on the three largest domestic networks. My estimate calls for unit sales growth of 120% in the December quarter. The iPhone will deliver not only strong unit sales gains, the product line will deliver market share and revenue share gains as well. I expect strong iPhone units sales to continue into FQ2 as the global roll out of the iPhone 4S extends to China's mainland beginning this month. For the quarter I estimate Mac unit sales of 5.15 million units representing anticipated year-over-year unit sales growth of 24.58% based on strong sales of the MacBook Air. The iPhone 4S and the MacBook Air are customer magnets for Apple's global network of retail stores. The continuing success of the Macintosh line of personal computers is due in part to what I call the "Apple product mutual halo effect." Mac unit sales will benefit from high customer traffic at the retail stores during the holiday quarter. In the September quarter Macintosh unit sales rose 26%. The December quarter will demonstrate a similarly robust unit sales growth trend. In CY2012, Apple may reemerge among the top five global vendors of personal computers. The Mac's unit sales growth is even more pronounced when compared to the unit sales growth of the overall PC industry. The Macintosh is Apple's oldest and most enduring product line and it will generate 15% of reported revenue in the quarter. The December quarter is the iPod line's last hurrah. All of Apple's iOS-based devices have iPod capabilities and the mass consumer migration to smartphones has eliminated much of the need for specific-use digital music players. I estimate the iPod line's unit sales will fall by 28% to 14 million. 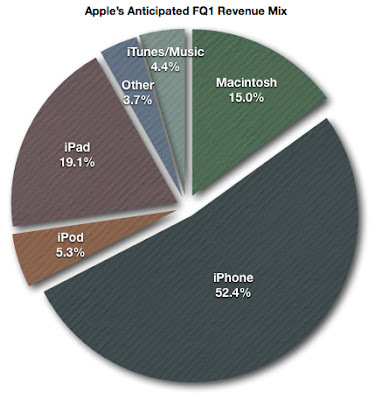 As recently as FY2006, the iPod was Apple's top revenue product. The iPod's rise and the iPod's fall are a testament to Apple innovation and the dynamic nature of the company's revenue growth. Following this quarter, the iPod line's results will be almost immaterial to the company's fiscal performance. For the quarter I estimate iPad sales of 13. 575 million units representing 85% unit sales growth. Consumer expectations of an iPad refresh in late winter/early spring will have dampened the rate of unit sale growth in the December quarter. Currently there isn't a serious competitor for the iPad 2 other than consumer expectations for the iPad 3. Apple entered the quarter with 2.5 million iPad units in the global channel. There's no reason for Apple to expand channel supply heading into the March quarter. Unit sales will primarily reflect sell-through in the period. That said, the iPad will generate almost 20% of the quarter's reported revenue and generate more revenue than Apple's Macintosh line of personal computers. Upon release, the iPad 3 will boost revenue and earnings growth for the balance of the current fiscal year. The iPad remains in a nascent phase of global market development and is unchallenged in its position as the top tablet-style computing product available to consumers. For the first time since the release of the Apple iPhone, Apple's first fiscal quarter will be 14 weeks in length. Once every six years Apple adds an additional week to the first fiscal quarter to better align fiscal quarters with calendar quarters. Apple's fiscal quarters are usually 13 weeks in length. The additional week every six years compensates for the fact 365 days is not wholly devisable by the seven-day week. This additional shipping week in FQ1, which encompassed the immediate post-Christmas shopping week, will benefit both revenue and earnings in the period. Implicit in my estimates is an expectation of strong revenue growth through Apple's global network of retail stores. On Apple's direct channel sales the company retains the retail margin on products sold. The release of the iPhone 4S in the quarter along with the corresponding increase in retail store traffic will benefit Apple's results in the December quarter. The iPhone 4S came to market with Apple utilizing the iPhone 4 enclosure. The lack of a material change to the new handset's form factor will boost margins in the quarter. The iPhone 3GS continues in its third year of production and iPhone 4 continues into a second year of sales. Apple benefits from economies of scale and volume purchasing power for components. The company's supply contracts provide for favorable pricing terms. I estimate gross margin in the quarter of 42.5%. For the quarter I estimate operating expenses will consume 8.25% of revenue. The reduction in operating expenses as a percentage of revenue over the past several quarters has boosted Apple's earnings growth rate relative to revenue growth. Apple's rate of revenue growth will continue to outpace the rate of growth in operating expenses well into FY2013. At $44 billion in estimated revenue, 34.25% of each revenue dollar will flow to the operating income line. In the June quarter 32.83% of revenue reached this line. For the quarter I estimate a conservative $95 million in earnings. Today's historically low interest rates are having a significant impact on yields from Apple's massive holdings of cash and marketable securities. Based on the factors mentioned above, I estimate income before taxes will reach above $15 billion as economies of scale and strong rates of growth drive more of each revenue dollar to the income lines. Apple's global expansion has produced more favorable tax rates due to lower average corporate tax rates outside the United States. For the quarter I estimate an average tax rate of 24.25%, higher than the June quarter's 23.5% tax rate but below the 24.7% tax rate in the September quarter. High gross margins, favorable tax rates and declining operating expenses as a percentage of revenue will deliver over 26% of revenue to the net income line. On an estimated 941.5 million fully diluted shares, I expect eps of $12.20. This represents an expectation of 89.75% eps growth on a 64.5% rise in revenue. I maintain a $640 price target on the shares and I expect the FQ1 results to be viewed favorably by the market. At Friday's closing price of $422.40, AAPL is trading at about 9.2 times my forecast FY2012 earnings of $46 per share. I will update my FY2012 estimates and revise my published price target following the release of Apple's FQ1 results on January 24th.